Pallas Kunaiyi-Akpanah goes up for a layup. 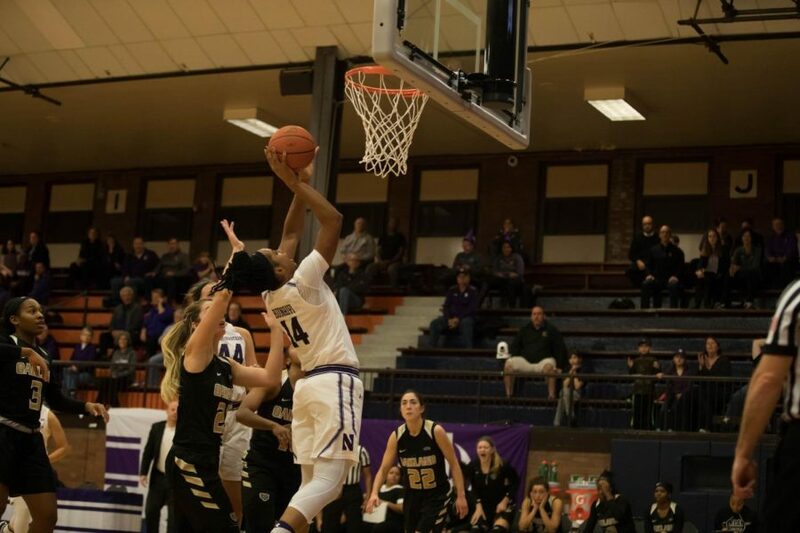 The junior forward helped Northwestern pull away from Santa Clara in the fourth quarter. At halftime of Northwestern’s game against Santa Clara on Wednesday, freshman guard Lindsey Pulliam had made five field goals. The visiting Broncos had made three. So went the contest at Evanston Township High School, where the Wildcats (4-0) suffocated Santa Clara (1-3) and held off a late push from the visitors to pull out a 57-47 victory. The Broncos shot 27.8 percent from the field for the day. After a slow offensive start for both squads, NU pulled ahead behind the play of Pulliam, who scored 14 of her team-high 16 points before the break. Pulliam has now scored 14 or more in three out of her first four collegiate games, though McKeown said he should have gotten her more looks against Santa Clara. She finished 6-of-7 from the field. Pulliam’s spark gave the Cats a 29-18 halftime advantage, which grew to 42-20 at one point in the third quarter. But Santa Clara charged back, staging a rally and cutting NU’s advantage to 5 with 4:33 to play. With tension rising among a holiday crowd at Beardsley Gym, Pallas Kunaiyi-Akpanah stepped up. Brushing off first-half foul trouble, the junior forward nailed a short jumper and followed it with a layup to stretch the Cats’ lead back to 9 with 2:22 to play. Moments later, Kunaiyi-Akpanah scored another bucket after a Santa Clara free throw to return NU’s lead to double-digits and all but ice the game. NU struggled to execute against Santa Clara’s active zone early in the contest, turning the ball over five times in the first frame, but settled in as the game went on. The Cats only put up 47 shots, but that proved to be all they needed. Despite a young squad with a number of new faces, they remained undefeated as they head into the Challenge in Music City, where they will play three games in three days. Taking in the win — and what he said was his first soda of the year — McKeown said postgame that his team is already showing signs of improvement.